Following our arrival in Istanbul we are met at the airport and transferred to our hotel. Optional half day sightseeing tour in the Afternoon. Dinner and overnight stay at our hotel. After breakfast we will drive to Ataturk Airport to catch our morning flight to Izmir. 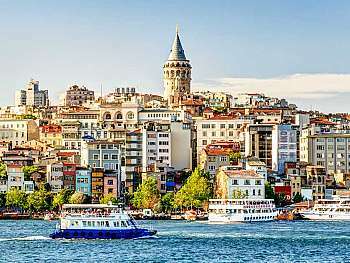 Upon our arrival in Izmir we will be transfered to Kusadasi to embark on 3 nights Cruise of the Aegean Islands. 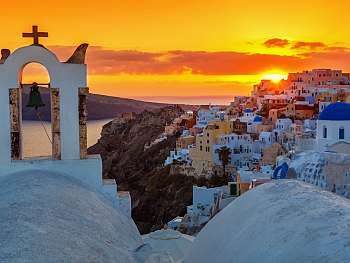 Our first stop in the cruise will be Patmos, this island is known as the site of the apocalyptic revelations of St. John the Divine, written here during his exile from the Roman Empire. The cave where he lived is near the site of the Monastery of the Apocalypse. The Monastery of St. John, built on one of the island’s highest points, houses priceless icons and manuscripts in its Treasury. Lunch, Dinner and overnight on board. This morning after breakfast, we will arrive to Heraklion, it is just three miles away from the fantastic ruins of the Palace of Knossos. Discovered in 1899 and partially reconstructed, the elaborate Palace is believed to be the mythical Labyrinth of King Minos and the seat of ancient Minoan culture. After Lunch. 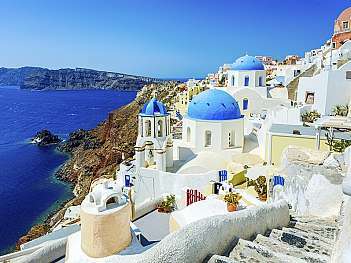 the next island will be Santorini perhaps the most breathtaking of all the Greek Islands, with its white-washed houses, narrow streets, open-air cafes and glittering boutiques. Dinner and overnight on board. Breakfast on board, after we will arrive to Piraeus, the port city of Athens, cradle of democracy, birthplace of Western Civilization, Athens is a vibrant city where old and new co-exist. The majestic Parthenon rises above the city, its ancient glory still visible in the time-worn Stone. Before arriving to the last island enjoy lunch on the cruise. The last island will be Mykonos, with hundreds of tiny chapels. Enjoy this blue and white-washed island with its beautiful windmills. Find a table on the waterfront and bask in the serenity of sunset over its picturesque harbor. Dinner and overnight on board. Early breakfast, arrive to Kusadasi at 07:00. We will proceed to the vast ruins of the ancient city of Ephesus. Once in the ancient city itself we will explore this ancient Roman city and visit the Library of Celcius, Temple of Hadrian, the Theatre and Odeon. 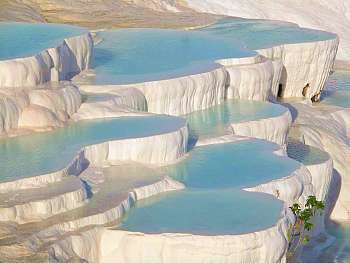 After lunch continue to Pamukkale “the Cotton Castle” with its snow-white terraces formed by thermal waters cascading down the hillside. Visit the ruins of Hierapolis with its famous Necropolis, the Basilica, Theatre and Plutonium. We will have dinner and overnight at our hotel in Pamukkale. After an early breakfast we set off for Cappadocia, with a visit to the Sultanhan Caravansarai on the way. Following Lunch in Konya we will visit the Mausoleum, Museum and Monastery Complex dedicated to Mevlana Celalettin Rumi, the founder of the mystical order often referred to as the “Whirling Dervishes”. Setting out once again we will enjoy lunch and our panoramic view of Cappadocia as we reach that strange and mystifying landscape. We will check into our hotel in Cappadocia where we will dine and spend the night. After breakfast we set off on a full day excursion that includes lunch. We begin our explorations of the famous and intriguing valley of Cappadocia, a unique region in which Nature has created an incredibly strange and colorful world of cones, columns and needles that were shaped by the wind and water erosion of the area’s volcanic tuff. Some of these strange shapes are as tall as 100 ft. But it is not only the natural landscape that is unique here, our forefathers used the soft features of the stone to carve out this fantasy-like environment into homes, stables, shops, churches, hospitals, etc. etc. Many early Christians painted the walls of their chapels with their own renditions of Bible stories. Some of these frescoes are incredibly beautiful, attesting to the skills and religious fervor of the faithful. After lunch, will visit are Goreme Open Air Museum, Castle of Uchisar, Underground City and Pasabag. 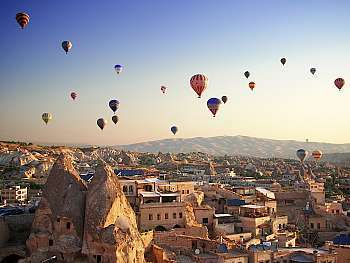 We will have dinner and overnight at our hotel in Cappadocia. After breakfast drive to Ankara. On the way a picturesque trip along the Salt Lake pass by the 13th century Seljukian Caravanserai Agzikarahan. After lunch, arrive to Ankara visit the Anatolian Civilizations Museum at which numerous remnants from Stone Age, Neolithic Age, Hittites, Urartians, Phrygians and many others are on display. We will have dinner and overnight at our hotel in Ankara. After breakfast transfer to Istanbul by bus. 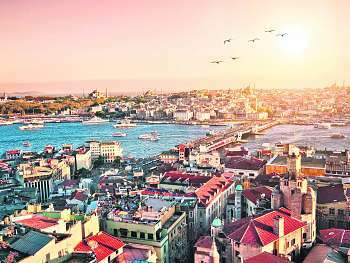 Arrival to Istanbul, Half day sightseeing tour of Istanbul including visit of the renewed Sultanahmet Mosque, known popularly as the Blue Mosque, this exquisite mosque built in the name of Sultan Ahmet is famous for its blue Iznik (Nicean) tiles and is unique for having six minarets. It was built from 1609 to 1616, during the rule of Ahmed I. Like many other mosques, it also comprises a tomb of the founder, a madrasah and a hospice. We continue to having lunch and to the Hippodrome, once the vast arena that functioned as the heart of sporting (chariots races and athletics) events and political activities of the old city. 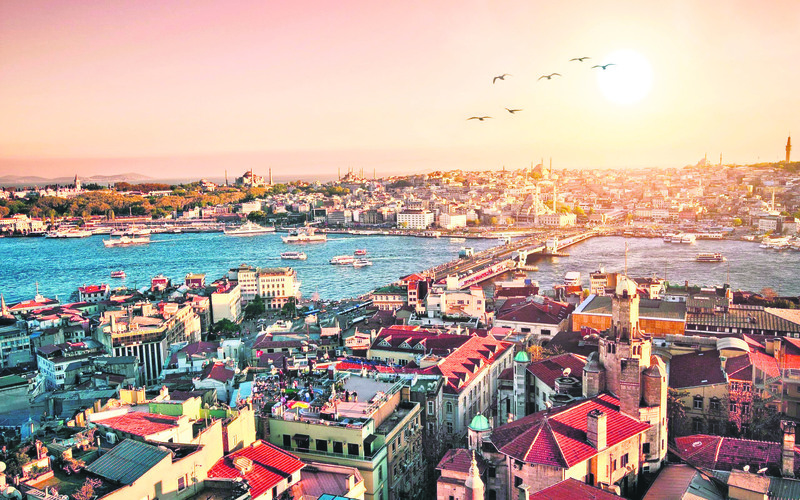 The tour will end with the visit to the Grand Bazaar, the vast and legendary covered market that is the biggest souk in the world with nearly 4000 shops of antiques, jewelry and carpets. We will have dinner and overnight at our hotel. After breakfast, we set off on a half day of sightseeing in Istanbul. We will start off with a visit to Topkapi Palace. This visit to the imperial palace of the Ottoman Sultans will include tours of the imperial treasury, the Chinese porcelain section, the calligraphy section and many more. We continue on to the Hagia Sophia, the Church of Divine Wisdom. 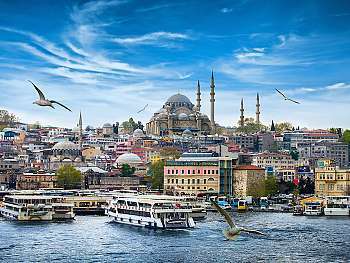 Ranking as one of the greatest marvels of world architecture, this awe-inspiring building was constructed as a basilica in the 6th century by Byzantine Emperor Justinian. Enjoy Lunch and have a free at leirsure afternoon. We will spend our night in the hotel in Instabul. After breakfast we will drive to the Ataturk Airport to catch our flight back home. • Beverage package during the Cruise consisting of: 2 soft drinks / 2 coffees or tea / 2 alcoholic beverages or 2 glasses of wine or 2 glasses of beer / 2 small bottles of water, above are per adult / per day.